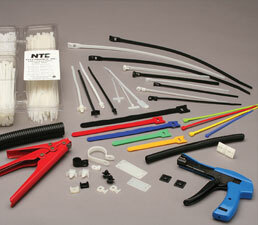 NTE has a complete line of Cable Ties and Accessories designed to work in almost all applications. From traditional nylon to reusable hook and loop, the selector guide on the right will allow you to quickly and easily find the one for your application. Standard - offered in a wide variety of colors, with tensile strengths from 18 lb. to 175 lb. Expandable Sleeving - easy to install, lightweight, allows flexibility while providing secure bundling for a professional look. We have recently added No-Fray Expandable Sleeving, which can be cut with a household scissor instead of a hot knife.